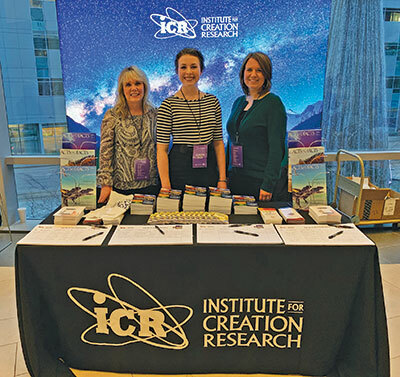 I recently worked a booth at a Dallas women’s conference, where ICR sponsored a table. We provided free books, magazines, devotionals, and information to anyone who stopped by our display. That first evening, my colleagues and I visited with dozens of women. The next day, a woman returned to our table and told us she had picked up our Creation Q&A booklet the night before, and she wondered if she could have more copies. She said she used it to share the gospel with another woman and that the woman had prayed to receive Christ. God used the booklet to change someone’s life, and she wanted more to share with others. What’s interesting about that 48-page booklet is that it doesn’t have a dedicated gospel presentation in it—it simply shows how science confirms what the Bible tells us about creation and assures the reader they can trust God’s Word. I don’t know details about the woman who accepted Christ, but I’m guessing she’s like many of the people we encounter who have doubts about God because they think the Bible doesn’t fit with science. We’ve discovered that when we show people that scientific evidence lines up with what the Bible says, then they are free to accept that God’s Word is true in what it says about salvation as well as science. The information we share at events and in our resources often removes the obstacles that have somehow kept people from trusting God. God’s Word is true in what it says about salvation as well as science. Creation Q&A is just one of the many resources we offer to help others understand how science confirms Scripture. Our 12-DVD series Unlocking the Mysteries of Genesis is a good introductory presentation that provides information about dinosaurs, the Flood, the Ice Age, the age of the universe, and more. We also offer a corresponding student workbook. Our Guide to… book series provides an easy-to-read approach to creation topics with plenty of illustrations in a beautiful format. Begin with Guide to Creation Basics to get a good foundation. If you have children, start with the Science for Kids series or the Little Creation Books for your preschoolers. Perhaps you’ve noticed that the Creation Q&A articles in Acts & Facts are written at a level for general readers. These engaging columns answer many of the basic questions people have when they’re first introduced to creation science, such as this month’s focus on what fossils are and how they fit with a young earth (“Are Fossils Just Rocks Shaped like Bones?”). And our serious science articles include highlights to help you navigate some of the more complicated information. These articles present current scientific research on important issues in the creation-evolution debate, such as Dr. Jeff Tomkins’ discussion of recent studies that refute the human evolution story (“Recent Humans with Archaic Features Upend Evolution”) and Dr. Jake Hebert’s examination of how old-earth beliefs influence the climate change debate (“Climate Alarmism and the Age of the Earth”). Through our conferences, our social media posts, our weekly online news articles, our publications, and more, we work to equip believers with the knowledge they need to challenge the misinformation that is rampant in our world. Our goal is to clearly communicate the message that you can trust God’s Word, and He uses it to change people, one life at a time. Cite this article: Jayme Durant. 2019. Changing Lives One at a Time. Acts & Facts. 48 (4).